When I left Sydney in 2003 I had joked several times that I was running away to join the circus. Fast forward to 2005 and I had joined Circus WOW. 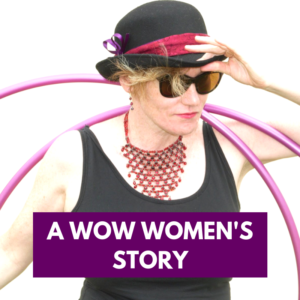 There were many things that attracted me to WOW – It was a Women’s circus, it was a community circus and it was a really interesting way to make friends in a town that was still new to me. I tried my hand at everything I could manage and particularly loved the general skills classes that were held every Sunday morning with most members of Wow attending each week. Wow was my sanity saver while at uni, it was my antidote to the stresses that accompanied full time study. Wow has taught me a great deal about the power of community based organisations and the benefits they bring to all of us. Wow has helped me to feel embedded within the community of Wollongong and has deeply enriched my life. Wow has given me many opportunities to express my ideas through movement and music. Over the years some persistent health issues have greatly curbed my involvement, every time I tried to get back into the rhythm of classes it proved too much for me physically. It was difficult to accept that my Circus WOW days might be over. In January 2018 the Acquired Taste Chior was formed as a new project for WOW. I leapt at the chance to be involved with Circus Wow once more in a way that I had not imagined happening and now I play guitar for the choir each week as we develop our own unique style and sing up a storm each week. Circus WOW acknowledge the traditional custodians of the land on which we operate, the Dharawal people, and pay our respect to their Elders, past and present.